Clayton Kershaw wasn't masterful yesterday afternoon, but he didn't have to be. The Dodgers scored six runs before he even got on the mound to pitch the game, and fourteen runs total to overmatch the Cubs 14 to 5. With the win Kershaw recorded his league leading 20th win of the season, and has no doubt made an undisputed claim to this season's Cy Young award. 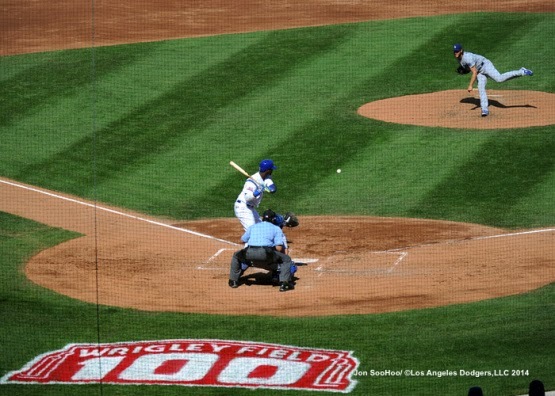 The photo above is of Kershaw mid-pitch at Wrigley Field, via Jon SooHoo/LA Dodgers 2014. Go here to check out more pics from yesterday. The Dodgers lead over the Giants in the Western Division increased to 3.5 games, and their magic number is now at six. BTW, the Dodgers also clinched, at minimum, a playoff wild card berth. Now, below are some links to check out. Via Mark Saxon at ESPNLosAngeles.com, "Dodgers skip wild-card celebration." Via Cary Osborne at Dodger Insider, "Matt Kemp is deserving of NL Comeback Player of the Year." I don't disagree. Via Mark Saxon at ESPNLosAngeles.com, "Ryu's next start could be in postseason." Via MLB's official historian John Thorn, "Fame & Fandom." He writes about some of the more famous fans to ever watch the game; including Brooklyn Dodger booster Hilda Chester. Via Jesse Rogers at ESPNChicago.com, "Barney relishing chance with winner." The Dodgers ranked #61 in ESPN The Mag's Ultimate North American franchise standings for 2014. Check out the list here. The LA Kings are ranked #5. The Lakers are #87. The Clippers are #59. The Angels are #15. The Ducks are #2. Via Ken Gurnick at MLB.com, "Lingering soreness keeps Uribe out of lineup." "He felt something in the same place that he's been going back and forth with for six to eight weeks," said Mattingly. "It's nothing he's not used to. He came in ready to go, but Stan [Conte, VP medical services] wanted to give him a day." Gross! Via Shawn Anderson at the Hall of Very Good, "Would I Like Some Cotton Candy? No Thanks." Not that any of you have gone to a baseball game with me (and if you wanted to take me…I’m totally down), but I never purchase food or drink that has been paraded around the park by a vendor. Why you ask? I swear you'll be disgusted by the photo he shares.